Your overall health and well-being are connected to your hearing health. Our Specialty Team is Here for You! Let us provide for your needs in sinus care, hearing loss, throat & voice services and pediatric ENT care. We care and want to listen to your story. Our practice welcomes adult and pediatric patients, and we believe that your health is the foundation for realizing your personal goals and experiencing the highest quality of life. 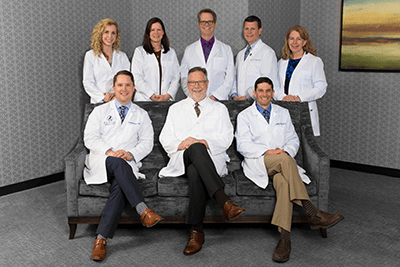 Our mission is to provide the highest quality Ear Nose and Throat care and Hearing Services to adults and children in the Twin Cities area. Balloon Sinuplasty has made such a difference! The first step to relief is evaluation by one of our specialists. You don’t have to live with sinus pain anymore. Enjoy a real improvement in your quality of life! Our specialists have been carefully chosen to adhere to our founding mission and vision of providing quality care. All of our physicians are board certified in Otolaryngology – Head and Neck Surgery. Our audiologists and nurse practitioners are fully credentialed and experienced in diagnosis and treatment. We want to make your patient experience outstanding by listening to you and making your health and quality of life our first priority. We are proud to serve adult and pediatric patients in the entire Twin Cities metro area. See Why We're the Twin Cities' Best Choice! 1 Levine et al. Multicenter Registry of Balloon Catheter Sinusotomy Outcomes for 1,036 Patients, Annals of Otology, Rhinology, and Laryngology, 2008, Vol. 117, pp. 263-270. 2 Weiss RL, Church CA, et al. Long-term outcome analysis of balloon catheter sinusotomy: two-year follow up. Otolaryngol Head Neck Surg 2008;139:S38-S46.